Hyundai Motor Vice Chairman Chung Eui-sun vowed on Friday to transform the automotive group in response to changes in the auto industry so that it can take the lead in India’s smart mobility revolution. Speaking in New Delhi at the first Global Mobility Summit, called MOVE and organized by the Indian government, Chung detailed the three-point strategy that Hyundai would pursue in order to reach its goal in the world’s fourth-largest electric vehicle market, where it now ranks No. 2 in sales after India’s Maruti Suzuki. That strategy, he said, will center on clean mobility, freedom in mobility and connected mobility. “Innovative changes in mobility is a means for us to improve our life, environment and energy related issues. I am certain it will also be the medium that connects the city and rural areas, reality and imagination, and people to people,” Chung said. India currently lacks the infrastructure and administrative systems to expand its electric vehicle industry, despite the size of its market and its leading role in IT. The two-day event, which focused on “shared, connected and zero-emissions mobility,” drew about 1,200 industry players, including the chiefs of India’s Maruti Suzuki, Tata Motors and Mahindra alongside CEOs of global auto companies Toyota, Honda, Ford, Mercedes-Benz and Volkswagen. As a “clean mobility” company, Hyundai said its first step would be to release three electric vehicles in India in the near future, in the pursuit of cleaner air and improved convenience in mobility. Hyundai is also seeking to launch the Nexo fuel cell electric vehicle there soon, after a test ride in February by Indian Prime Minister Narendra Modi. 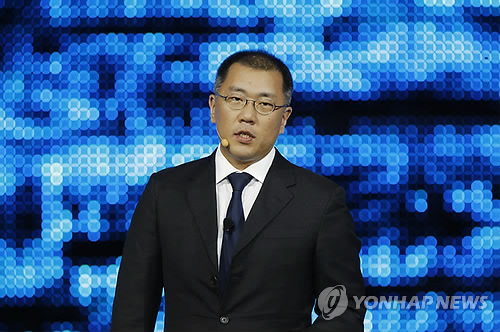 Modi and Chung met up at Hyundai’s digital exhibition at the event venue before the summit, marking their fourth official encounter, the company added. Hyundai Motor’s sales in India rose 7.5 percent on-year in July, amounting to roughly 320,000 units on the success of the supermini car i20 and the compact sport utility vehicle Creta, the company said. Sales of the i20, designed exclusively for the Indian market, stood at some 74,000 units, up 7.6 percent, while Creta sales increased 14.6 percent to about 71,000 units.